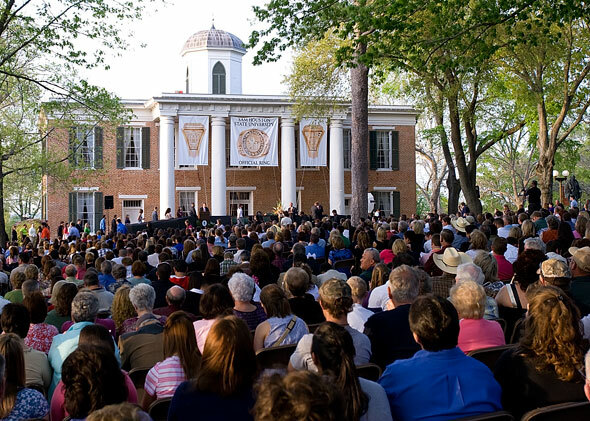 With historic Austin Hall in the background, a record 540 Sam Houston State University students received their class rings during the Seventh Annual Ring Ceremony Thursday evening. “The ring ceremony is an important milestone and achievement in a student's educational career,” said Charlie Vienne, director of Alumni Relations. “It is a short-term goal in reaching their ultimate long-term goal, a college diploma. The ring is a reminder throughout the rest of your life of the good times and friends met during your brief stay on the Sam Houston campus,” he said. “You also carry something with you that one of our greatest heroes carried with him...the word ‘honor,’ which is inscribed on the inside of each class ring,” Vienne said. Participation in the ceremony has increased each year since the first event was held in 2004. At that time, 183 students received rings. This year’s ceremony was the last ring ceremony for alumnus Jim Gaertner as president of Sam Houston State University. The Official Ring Program was one of Gaertner’s initiatives. Brian Van Delist, the student speaker at the first ring ceremony and member of the Class of 2005, presented the replica to Gaertner. For mass communication senior Linda Borja, of Houston, the ring she received Thursday evening represents the hard work of her family so that she could have a college education, as well as her own accomplishments. “I am the first in my family to attend college and want to squeeze out every ounce of the college experience,” she said. “The ring shows the dedication I have put into my education and also is a reminder of the opportunities I have that my parents did not,” she said. Even though her father’s job was cutting back on hours and Borja felt that her family couldn’t afford the ring, she said her dad insisted that they order one and she participate in the ceremony. “When both my parents told me they wanted me to have a class ring, I then realized that what they wanted for their family is represented in that one ring,” she said. “The official ring of SHSU has the word ‘honor’ inside of it,” she said. “SHSU’s official ring is an honor to have. Each junior and senior participating in the ring ceremony has their own meaning for the word ‘honor’ on their ring. “For me, it’s an honor to have my entire family here with me at this special Bearkat tradition in which all of my sleepless nights and tears are being celebrated."